For me, the most important aspect of my RV trailer is the generator. I have never been one who has dealt with power outages well—I just like my home comforts too much. Generators, however, can be bulky, and not all RVs feature compartments where you can easily store the unit. If you do put the generator in your trailer, you will have to haul it out, with some generators weighing a hundred pounds or more. 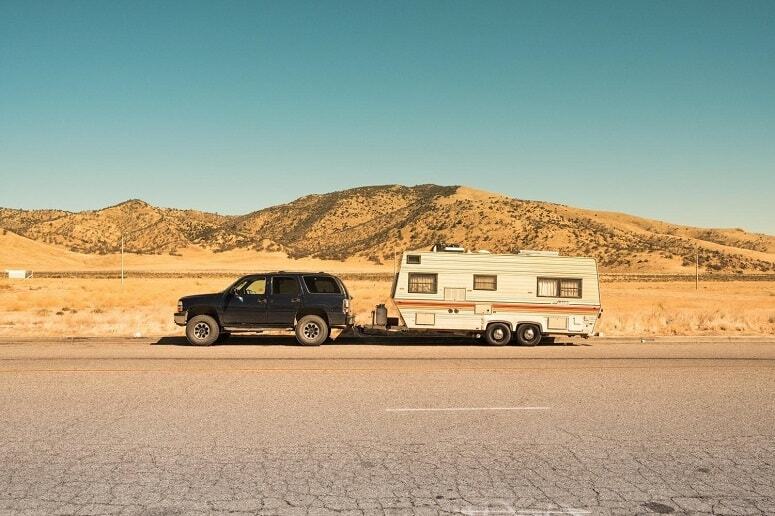 Additionally, it could make your RV smell of gas—hardly ideal for your home on wheels. Outside mounting seems to be the obvious answer. This involves attaching the generator to a frame, or directly to the bumper of your trailer. But what are the best solutions for mounting a generator to a trailer bumper? Let’s take a look, after all, the last thing you want is your generator falling off in the middle of Route 66. For many, this seems like an ideal solution. An A-frame cargo carrier can fit above the propane tanks at the front of your trailer. The ride at the front of your trailer tends to be much smoother, and with the generator mounted to the actual frame of the trailer, it’s more secure. Something like the Stromberg Carlson cargo carrier is ideal for hauling a generator. Their CC-255 trailer tray supports up to 300 pounds, which should be more than enough for most generators. The height is adjustable, so it will fit most A-frame trailers, and sits over the propane storage boxes. Installation of a tray or frame at the front of your trailer can be the easiest option, with many kits including all the parts you need. And, as a bonus, you don’t put any extra stress on the bumper of your trailer. The platform can be adjusted to provide a clear weight distribution, which guarantees a smoother ride. The only downside I see with this solution is that if you have larger propane tanks, the frame might not accommodate them. You may also find the tray blocks access to the propane, so you have to unscrew the shelf with a wrench every time you need to change out the gas. If you’re set on attaching the generator directly to your bumper, this is one of the easiest ways. 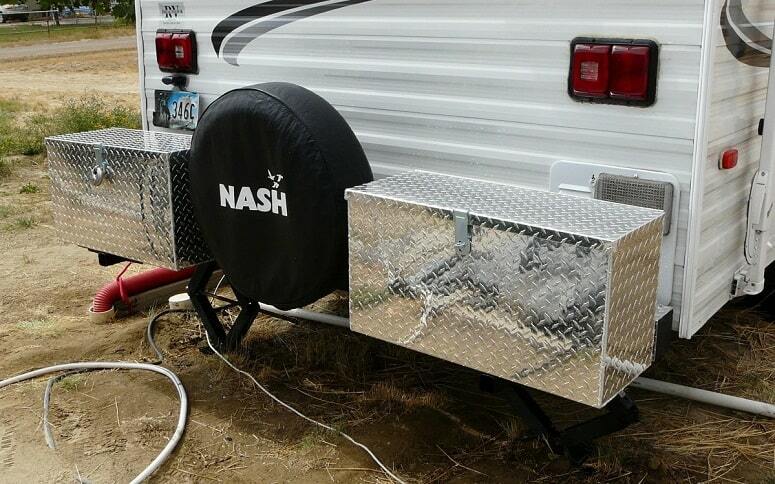 Basically, a large platform is mounted to the rear square bumper on the back of your trailer. The main danger with this method can be if your rear bumper is not designed to carry such heavy weights. Many reviews of hitches that mount to RV bumpers are full of horror stories, where people have had their bumpers ripped off. This can even happen when carrying bikes, let alone an 80-pound plus generator. If you are cruising down a highway at 80 mph and your generator falls off the back, it could quite possibly kill the driver behind you. If you do want to go down this route, always check the carrying capacity of your bumper and, at the very least, buy some safety struts to reinforce your bumper. The following YouTube video shows how you can install a stronger bumper for towing other vehicles or mounting heavy loads. The problem with the second option we looked at is you will always be nervous about whether your bumper is strong enough. Bouncing down the freeway can put even more stress on your bumper. Many RVers have learned the hard way how dangerous it can be. The well-known hitch manufacturer, Curt, has addressed this problem, with a hitch that mounts onto the frame of your trailer. With the Curt 13703 Adjustable RV Trailer Hitch, a large sturdy bar attaches underneath your bumper to the actual trailer. Once the hitch is installed below your bumper, it will allow you to carry much more weight, like the hitches found behind SUVs. One problem can be when going up steep climbs, the back of your carrier may hit the ground. The hitch will be a little lower than traditional bumper hitches, and you need to be extra cautious about bottoming out. If you mount a straight shafted carrier, you are more likely to hit those mounds of earth as you boondock in the woods. It’s always worth looking for a carrier which features an angled shank, to avoid this issue. Storage trays or baskets can be an ideal option for mounting a generator to your bumper. Many of the cargo carriers can handle loads up to 500 pounds, enough for even the largest of mobile generators. Just make sure you securely fasten your generator down before traveling—and use chains and locks on it, to stop thieves. The following YouTube video shows a DIY project for building a bumper extension and storage box. Remember, as always, check the weight capacity of your bumper before stacking up heavy loads. Mounting a generator to your trailer bumper is an achievable task. A front-mounted tray, like the Stromberg Carlson CC-255 trailer tray, can be a safe and convenient option for many. However, rear mounts seem to be the more popular solution, just check the strength of your bumper first. We prefer the idea of a rear-mounted and frame-connected hitch, which will support the heavier weight of your generator and not rip the bumper off—never a good thing! The Curt 13703 Adjustable RV Trailer Hitch offers a solid hitch which uses the strength of your trailer frame, rather than just the bumper. If you have any questions or other suggestions on how to mount a generator to your trailer bumper we are waiting to hear from you. I really appreciate you mentioning that the best cargo carriers can carry loads as heavy as 500 pounds, which is about as heavy as the biggest mobile generators for your RV. 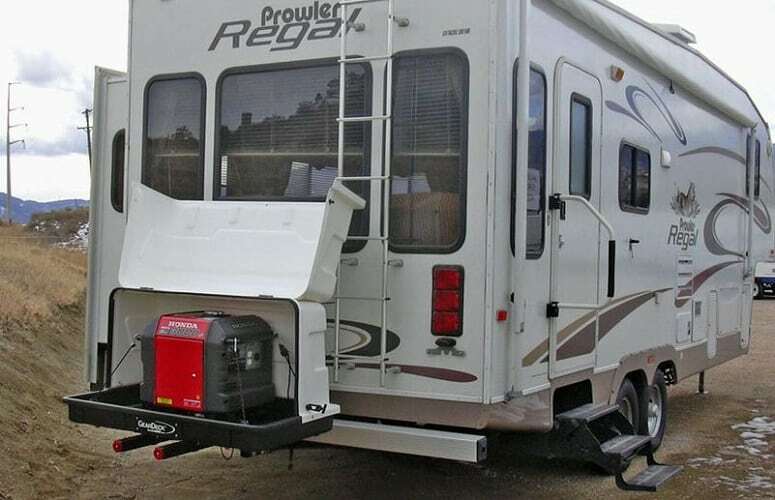 Dad likes to have this sort of multi-functional RV cargo carrier so he could bring in not only a generator but also a couple of ATV’s for the family’s summer adventure. This would be fun since whether we camp out by the Everglades or the Grand Canyon, there’s always a power source to go with our all-terrain buggies for an unforgettable rough road race.